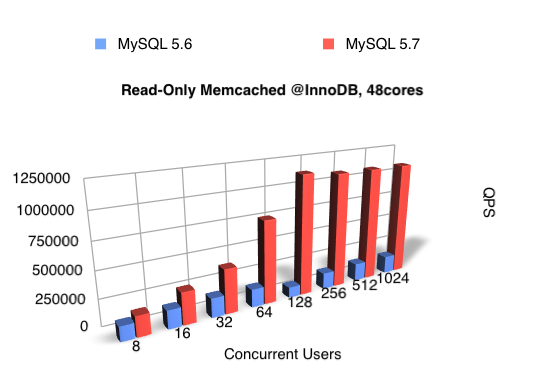 Last week, during Tomas' keynote at MySQL Percona Live Conference in London we announced as one of "previews" of the following MySQL 5.7 release(s) -- an over 1,000,000 Query/sec result obtained with InnoDB Memcached plugin on a Read-Only workload. This article here is just to confirm the announced results without going too much in details.. 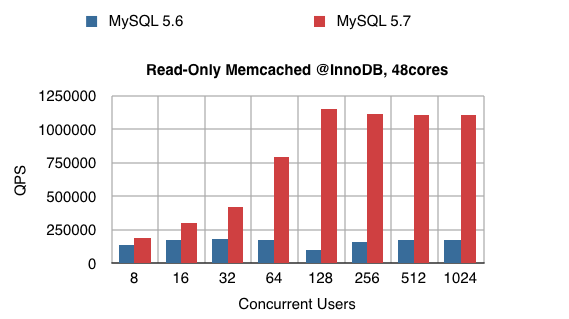 I've placed in legend "MySQL 5.6", while a true label should be rather "the best result we observed until now" ;-)) -- because some part of Memcached code improvement will be back-ported to MySQL 5.6 as well, so we may expect to see next 5.6 releases running here better too. However - only with MySQL 5.7 code base you'll be able to go really high..
#1 - running on 48cores as it.. - we're hitting a severe contentions related to the MVCC code (which was fixed in the latest MySQL 5.7)..
#2 - limiting MySQL server to run on 16cores only to lower this contention.. - and then hitting transaction related contentions (which was also fixed in the latest MySQL 5.7 code)..
#3 - tune memcached plugin to keep several reads within a single internal transaction -- helps, but hitting other contentions..
#4 - limiting MySQL server to run on 8cores to see if contentions may be lowered -- indeed, the max peak QPS becomes higher (on 32 users), but overall performance is worse..
#2 - is using "tuning" option to keep several reads within a single internal transaction - just slightly better on a peak max QPS, otherwise no significant difference anymore..
all the curves on the left parts of graph representing QPS levels obtained on the "previous" MySQL 5.6 / 5.7 code..
then, the last curves on the right part - with the latest MySQL 5.7 code.. So, work is still in progress, and I let Sunny and Jimmy provide you all deep details about this huge step forward we made in the latest MySQL 5.7 release! Kudos to Sunny and Jimmy! And my special thanks to Yoshinori (Facebook)! - I think this is an excellent example where a common work on a given problem provides a fantastic final result for all MySQL users!..